... help an emerging leader step up and shine. ... share resources which accelerate their impact. ... build your leadership legacy. then now is the time to join us as an Acorn Mentor! Now is the time to inspire confidence and ignite the potential of our industry's emerging leaders and young managers. Accelerate the career of a young manager. The Acorn Mentoring Program is a five-month online program and facilitates mentoring partnerships across Australia, allowing you to support tomorrows leaders, engage our next generation of talent, and support our industry's leadership pipeline. 46% of Generation Y will make up the workforce in 2020, but right now our aged care workplaces employ less than 25% of them (1,2). Now is the time ensure our future leaders have the skills and confidence they need to succeed - careers, pathways, leadership pathways and more. 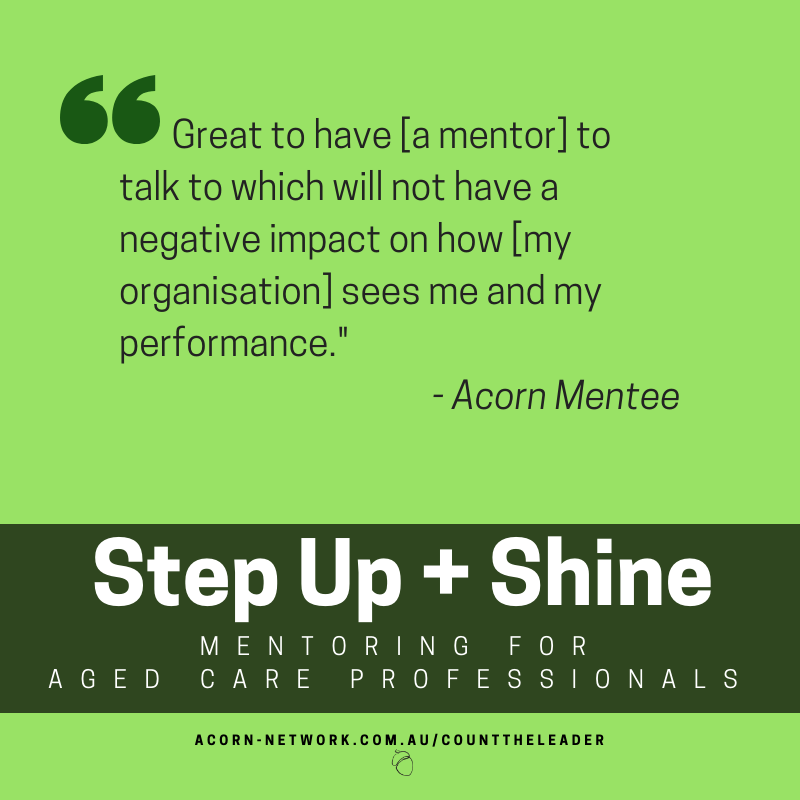 Are you ready to help them step up and shine, and become the aged care leaders of the future? 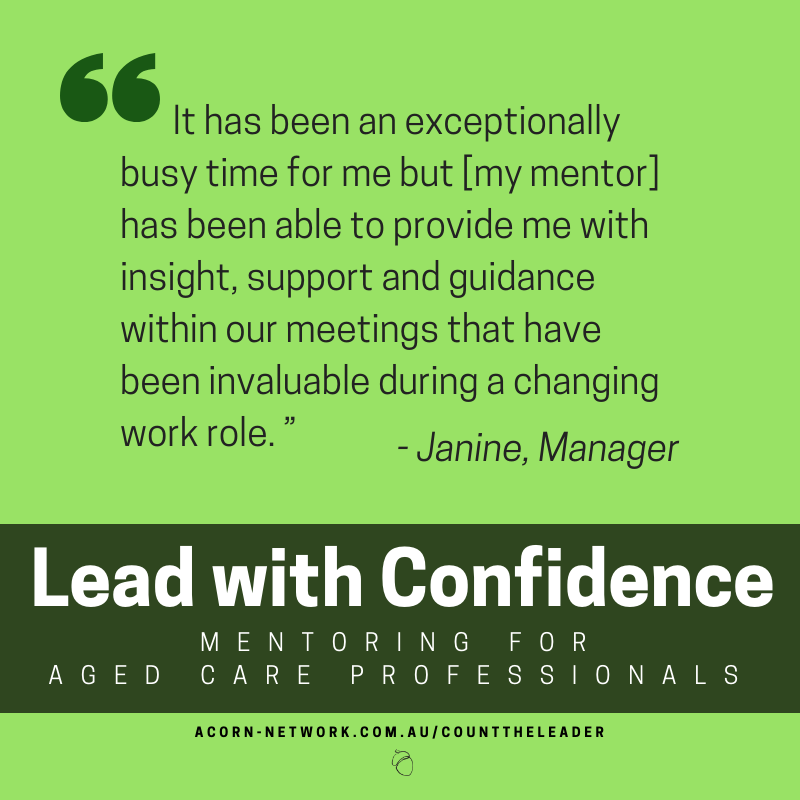 Many of our emerging aged care leaders come up against barriers and don’t know where to turn to. This program is carefully designed to support collaboration, connection, and build strong mentoring partnerships. As an Acorn Mentor, you will be sharing insights, experiences, and your ears with aged care's emerging leaders and middle-managers. Helping to improve their ability to lead teams, projects, and build better relationships with their senior managers. A minimum 8 years leading and managing in team environments (note: no clinical experience required). Willing to commit 1 hour a month over 5 months to supporting your mentee. I'M KEEN. WHAT DO I DO NEXT? We're pretty excited you're as pumped for this program as us! Fill out our application form right now and let's get you matched to an amazing mentee! WHAT EXACTLY IS THE ACORN MENTORING PROGRAM? This is an interactive way of learning through a five-month mentoring partnership and online learning program, allowing your talented managers and emerging leaders to determine their own mentor path and find the resources they need to succeed. Participants can be from anywhere in Australia (interstate, urban, rural, remote) as our program is fully online. 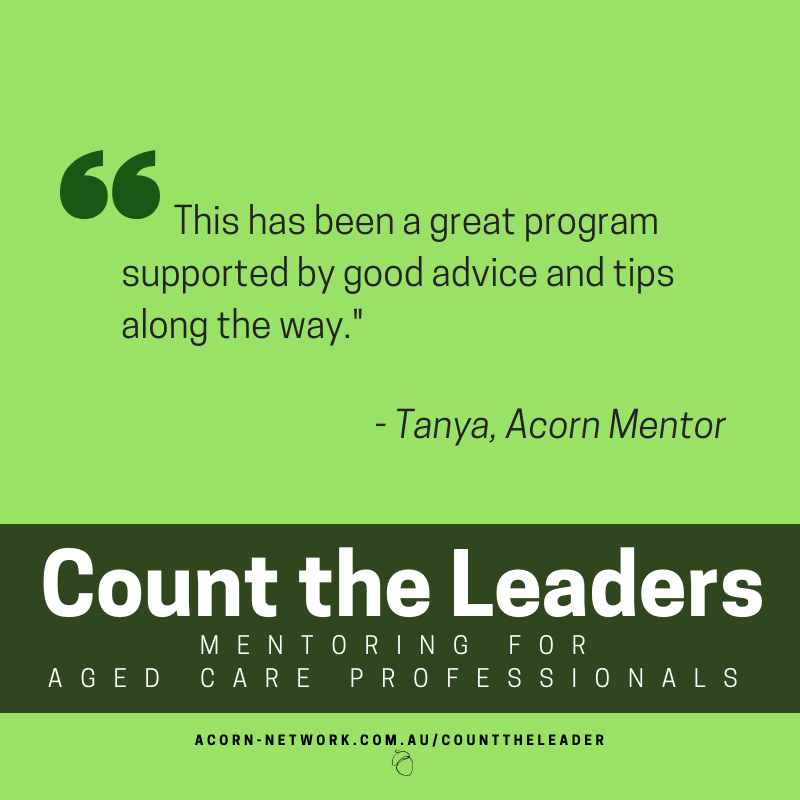 We want to ensure our mentors are accessible and able to support the variety challenges that can arise in our aged and community care workplaces. When does the Acorn Mentoring Program start? We are dedicated to creating a carefully curated resource and a great cohort of mentors/mentees, so our intake is limited to ensure everyone receives dedicated support throughout your time in this program. Get in touch right now to ensure you don't miss out! 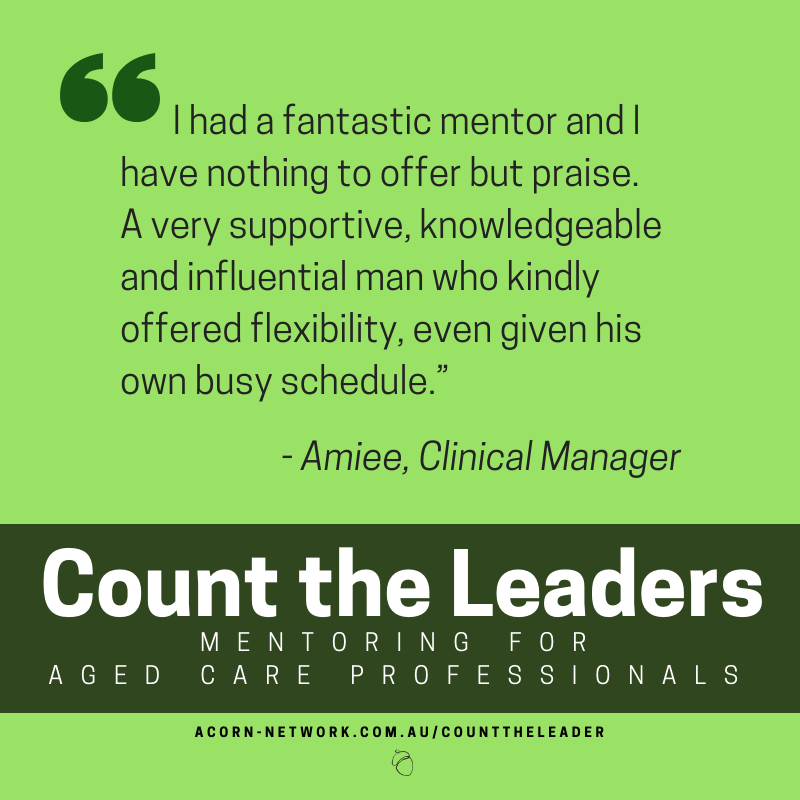 Anyone with a passion for aged and community care careers is invited to submit an application to be a mentor or mentee - students, DONs, entrepreneurs, consultants, and more. 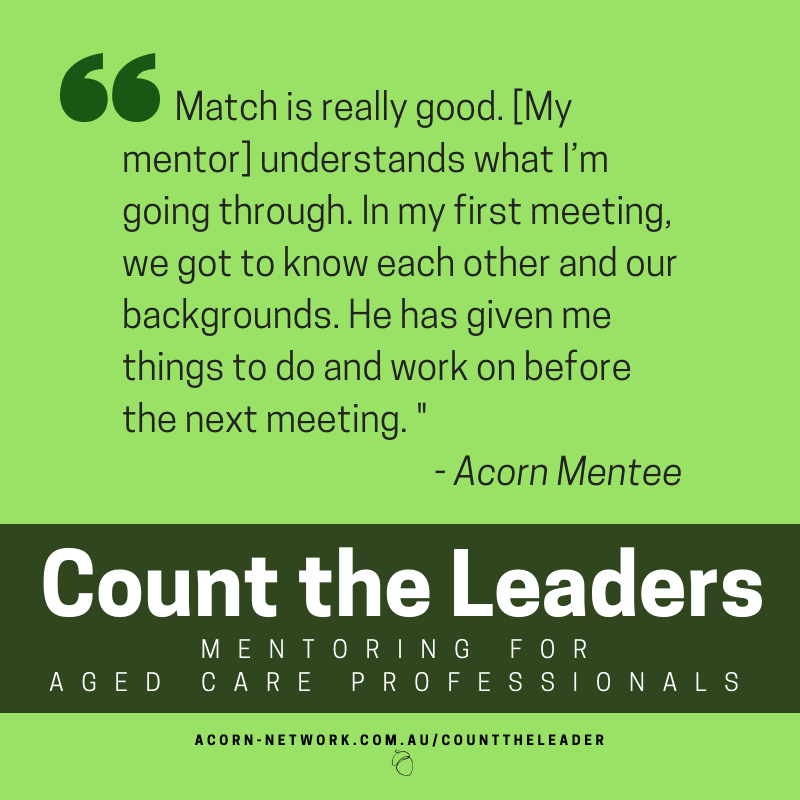 Acorn Mentors are CEOs, GMs, aged care consultants, and influencers who are passionate about supporting the leaders of the future. As long as there is mentoring experience (and a drive to learn) we welcome everyone to connect with our passionate and driven Acorn Mentees. There is no fee for mentors, as they are graciously volunteering their time and sharing their experiences. My employer has a mentoring program already. How will this be different? Our program will match you with a mentor/mentee who is outside of your organisation. Increasing industry connections, widening knowledge of different ways of tackling issues, and supporting professional goals. Yes, internal programs are fantastic, and we encourage you to explore these. We know that cross-organisational support is a way that will further support your people to become the leader they want to be. I work in mental/direct/other health career. Can I still apply? Of course! Our program welcomes all applicants from a range of healthcare disciplines, as we know we are all involved in the ageing and community care industry in a variety of ways. We prioritise aged and community care applicants where possible. ARE YOU INTERESTED IN BECOMING A mentee INSTEAD?